Jabref: import and export of bibtex files. bibtex4word: This is a bibliographic add-in for Microsoft Word that allows the citation in a Word document of references from a BibTex database and the insertion into the document of a bibliography using almost any BibTex style. Mineral Commodity Summaries (USGS). Published on an annual basis, this report is the earliest Government publication to furnish estimates covering nonfuel mineral industry data. Data sheets contain information on the domestic industry structure, Government programs, tariffs, and 5-year salient statistics for over 90 individual minerals and materials. World Mineral Statistics (BGS). The British Geological Survey has one of the largest databases in the world on the production and trade of minerals. Geochemical Earth Reference Model. The Web Site for Earth Reference Data and Models. It contains six different databases including information on geochemistry of all world reservoirs, petrological and chemical information of rocks, seamount maps,etc. Amethyst Mineral Galleries. Amethyst Galleries' Mineral Gallery is a large collection of mineral descriptions, images, and specimens together with several ways of accessing these descriptions. BP Statistical Review of World Energy. This review provides high-quality and globally consistent data of the energy markets, with a history series of statistics dating back to 1965. World energy outlook. The World Energy Outlook is a publication of the International Energy Agency and is recognized as the authorative source for global longterm energy market analysis. NRDB. The NRDB is a compilation of observations of flora and fauna made at open space and nature preserves in the greater San Francisco Bay Area. The database can be searched for available data on flora, mammals, birds, and reptiles-amphibians-fishes seen at one or more preserves. Society for Conservation Biology. The Society for Conservation Biology (SCB) is an international professional organization dedicated to promoting the scientific study of the phenomena that affect the maintenance, loss, and restoration of biological diversity. The Society's membership comprises a wide range of people interested in the conservation and study of biological diversity: resource managers, educators, government and private conservation workers, and students make up the more than 10,000 members world-wide. Club of Rome. The Club of Rome is a global think tank and centre of innovation and initiative. As a non-profit, non govermental organisation (NGO), it brings together scientists, economists, businessmen, international high civil servants, heads of state and former heads of state from all five continents who are convinced that the future of humankind is not determined once and for all and that each human being can contribute to the improvement of our societies. The International Society for Ecological Economics. The International Society for Ecological Economists (ISEE) facilitates understanding between economists and ecologists and the integration of their thinking into a trans-discipline aimed at developing a sustainable world. CIRCE. Centre of Research for Energy Resources and Consumption. From its headquarters at the Polytechnic Centre of the University of Zaragoza (Spain), several companies and Institutions collaborate with CIRCE to promote the technology innovation and the transfer process. The intellectual and creative potential of its researchers is made available to the energy sector, the business world and society as a whole. In the year 2001, CIRCE was recognised as a National Innovation and Technology Centre. Since then it has also been a member of EUREC (European Association of Renewable Energy Research Centres). Institute of Thermal Technology (ITC). World Resources Institute. World Resources Institute (WRI) is an environmental think tank that goes beyond research to find practical ways to protect the earth and improve people's lives. 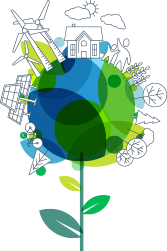 The World Resources Institute's mission is to move human society to live in ways that protect Earth's environment and its capacity to provide for the needs and aspirations of current and future generations. Laboratoire d'Energétique Industrielle. LENI is a center of excellence in teaching and research related to thermodynamics and to sustainable engineering of energy systems (thermal or electrochemical) and industrial processes.